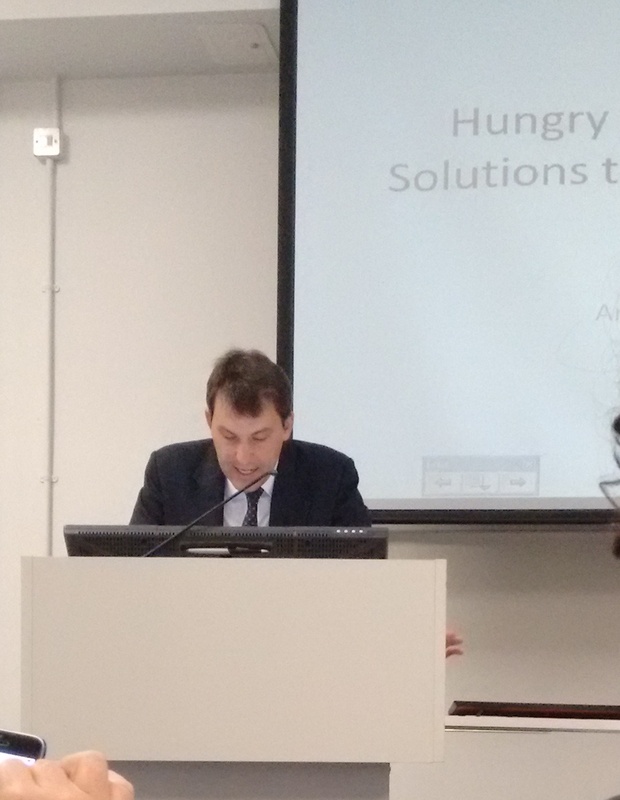 On 13th May 2015 I attended a day-long conference in Camden, London, entitled “Hungry for change? providing solutions to food poverty in the UK”. The aim of the event was to provide an understanding of the current methods for alleviating food poverty using only limited resources, and experts in the field representing different charitable organisations gave talks throughout the day on various topics. Representatives from the NHS, Oxfam, the National Housing Federation, Child Poverty Action Group, and the Trussell Trust were among those present, so the room was well-equipped to deal critically and constructively with suggestions for improvements in the methods charities are using and also government policy. With regards to the latter, the opening keynote address was by Mr John Glen, Conservative MP for Salisbury, which instantly sparked political debate in the audience. Mr John Glen, Conservative MP for Salisbury, speaking about the causes behind food bank use and the need for less “party political rhetoric” in policy approach. A political spat followed the initial address by Mr Glen, mainly between he and the Chief Executive of the Trussell Trust Mr David McAuley, who followed as the next speaker. As the Trussell Trust was founded and has it’s headquarters in Salisbury, the two speakers had met and worked together closely before. The atmosphere which resulted from this exchange of words hung over the rest of the proceedings, and the biggest point of the day seemed to be that those genuinely concerned with this issue need to take a step back from politics and apply a rational and unbiased approach to finding solutions. This was the point made by Mr Glen (a piece similar to his speech at this event can be found here, notice his mention of “party political rhetoric”). 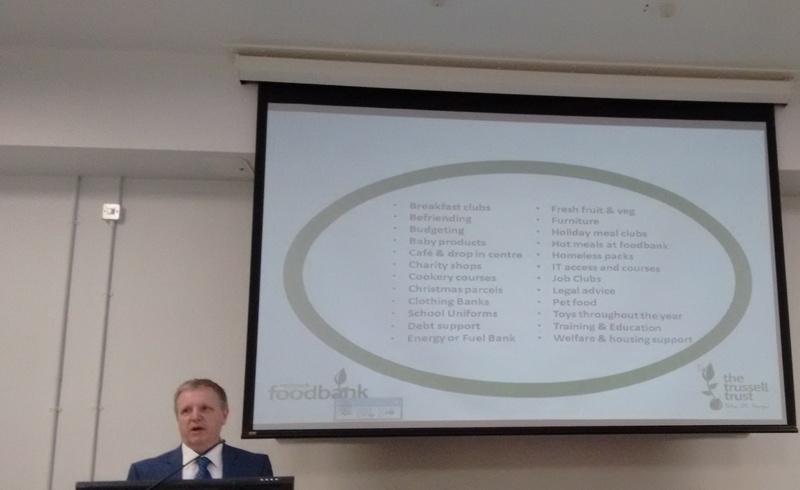 Mr David McAuley, chief executive of the Trussell Trust food bank charity, speaking at “Hungry for change?”. I started thinking about stepping back from our political beliefs and how removing biases and preconceptions is more difficult to do than it is to say, so I looked a little deeper and unearthed some interesting findings. For example, a survey undertaken and published in 2009 by Ipsos MORI revealed just how wrong the British public can be about important social and cultural statistics. For example, 29% of people surveyed thought that the government spends more on job seekers allowance than on pensions. The actual figures reveal that 15 times more is spent on pensions than on job seekers allowance (£4.9bn for job seekers and £74.2bn for pensions). In fact the amount spent on job seekers allowance is actually one of the smaller amounts of benefits paid in welfare support. British attitudes towards the welfare state (perhaps as a result of these misconceptions) are equally as informative. According to a British social attitudes report conducted by Nat Cen social research, in 2011 54% of people surveyed agreed that if benefits were less generous people would “stand on their own feet”, 33% agreed that the welfare state encourages people to stop helping one another, 23% disagreed that cutting benefits would damage too many people’s lives, and only 15% of people agreed that the creation of the welfare state was one of Britain’s proudest achievements. It’s fairly easy to view public opinions like these and to blame them on modern day inflammatory material such as the “media”, especially when television programs like ‘Benefits Street’ seemingly portray the most extreme and biased example of benefits claimants. However, in my opinion, there are similarities between these and the views of the public health reformers in the 1800s such as Edwin Chadwick, who was responsible for the introduction of the Poor Laws. Isn’t the argument to reduce benefits in modern Britain, thereby “encouraging” people to improve their lot, the same ideology as Chadwick’s efforts to make the living conditions of poor houses so intolerable that people would do anything to avoid them? Essentially, both arguments call for discouraging people from relying on the state by taking away an amount of state aid. The problem with Chadwick’s policy, of course, was that deprived people became ill, and ill people cost the state money. Clearly there has been an underlying concern with the amount afforded to the poor for at least 200 years, and although the suggestions have become less extreme (thankfully it is no longer necessary to go into a workhouse!) opinions on how to control the poor are based on worryingly similar theories. Perhaps at the same time as tackling the issues causing food poverty, there should also be a focus on education in order to remove the stigmatisation of Britain’s most vulnerable groups. Just a thought. June 30, 2015 in Uncategorized. ← Of bones, beads and bracelets. The Festival of Ideas at York.